At the end of 2016, Merriam-Webster announced its word of the year: surreal. It was a fitting description for a mind-boggling year around the world, and a word that some might argue still applies in 2017. But that’s not the type of surreal we’re focusing on today. Instead, we’re turning our attention to the man who took surrealism to a whole new level: Salvador Dali. Why? Because today marks his 113th birthday. From melting clocks to the cover of Vogue to a hologram of Alice Cooper’s head, Dali’s work is both multifaceted and widespread. To this day, it continues to influence other artists, including musicians. Here are 13 music videos in which you either see references to his works, or a channelling of his surrealist style. "I’d been reading a lot and watching a lot of stuff like Salvador Dali, and based the whole film video on this kind of very surrealist filmmaking," said Dave Stewart about the making of this Eurythmics video. "It's very inspired by, especially in the beginning, Salvador Dali and Francis Bacon, the surrealist painters," said Lady Gaga, in an interview before the premiere of this seven-minute video in 2011. When OK Go premiered the video for "The Writing's on the Wall," parallels were drawn to Dali's mind-bending artwork. Dali's The Persistence of Memory makes a cameo of sorts in this Joss Stone video. Just wait for the melting clocks to appear at 1:05. From the choruses of this song, to the autonomous body parts, to the close-up of an eye opening at 0:29, comparisons have been made between "Sledgehammer" and Dali's 1929 collaborative film Un Chiel Andalou, featuring his wife, Gala. Gates channels his inner Dali, as he explores a surrealist desert landscape filled with ruined buildings and melting clocks. From recreating Dali's painting The Temptation of St. Anthony (02:02) to dressing up like the artist himself (02:52), Chinese singer Jane Zhang's video is an homage to the surrealist and many other renowned artists. Director Buddhatron was inspired by a 1953 Philippe Halsman photograph of Salvador Dali, titled Explosion, for Texan rock band Quiet Company's video. He filmed it by projecting footage onto a pool of milk. Much like Dali's melting clocks and Lincoln in Dalivision, the images and colours in this trippy video melt into one another. British rock band Esben and the Witch teamed up with director Rafael Bonilla to create a colorful claymation world that is sinister, playful and filled with inventive characters, inspired by Dali’s painting (and poem) The Metamorphosis of Narcissus. There's no beating around the bush with this video by Cape Town artist YesPlsNdThnkYou. 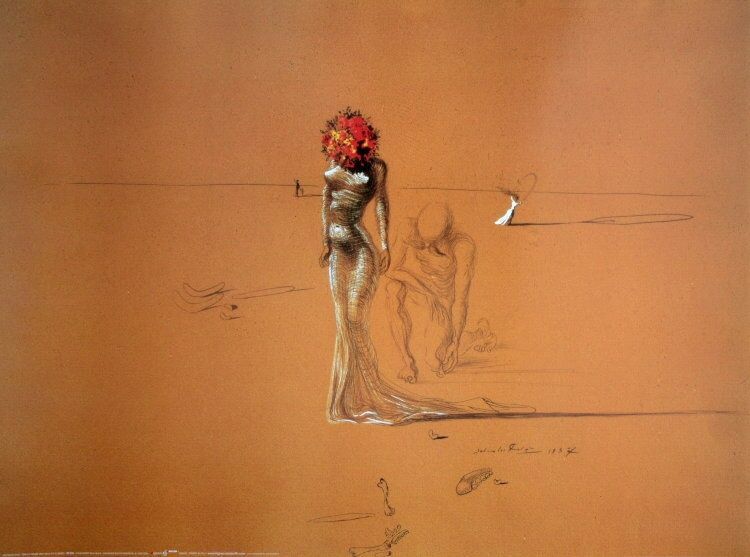 The woman he is following looks almost identical to Dali's Female Figure with Head of Flowers. D.C. alt-rock group Sneaks’ video looks like it's channelling the Dali-Disney collaboration short film Destino, which began production in 1946 but was ultimately completed and released in 2003. While he isn't listed as an inspiration for Spanish band Fur Voice's video, the dreamy and surrealist narrative of "Fantasia" has a Dali-esque feel to it.